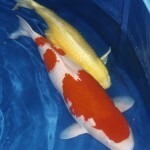 Pond Keeping Advice: Koi, Goldfish, pond water quality, blanket weed and algae control. A guide to enjoying your garden pond. All you need to know for your pond and pond fish to survive the harshest winter in a garden pond. The Water Gardener’s Bible – Free Pond Advice. Over 300 FREE pond keeping articles from the author of the international top-selling pond book ‘The Water Gardener’s Bible’. Advice and information on planning, constructing, stocking and managing a beautiful garden pond. 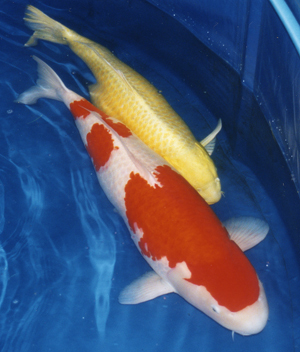 You might have in mind a wildlife pond, a koi pond or a conventional back garden pond (informal or formal) next to which you are wanting to relax and enjoy it stocked full of beautiful ornamental pond fish such as koi, orfe, goldfish and shubunkins. You will learn how to choose the best pond pumps, filters and other pond equipment for the best pond, and how to keep your pond looking stunning, without any nuisance algae, blanket weed or string algae. Free hints and tips on how to solve many of the common pond problems that a new pond can experience. Why do most of us aspire to owning a garden pond or some form of aquatic oasis in our back garden? Our love of ponds and water does seem to go much deeper than wanting fish or aquatic wildlife in our living space. Holidays by the sea, weekends up at ‘The Lakes’ and walks along hillside torrents fill us with a sense of fulfilment and belonging. So strong is our need to be close to water that we bring some closer to home where it can comfort us each day. To an ‘outsider’, this may appear illogical, but on reflection, our desire is just as much a biological requirement as an aesthetic need, with our subconscious eager to make us feel complete. Nature seems to have left a hole in our psyche, and an oasis of water (particularly moving) appears to fill that void. We can soon satisfy our aquatic craving with a number of alternatives that bring the enchanting atmosphere of moving water to a back yard or garden. A new dimension of the sight and sound of water bubbling and sparkling as it tumbles from its source through the sunlight. The erratic, yet natural routes that water chooses to take, producing a similarly random backdrop of hypnotic sounds as it trickles, falls or tumbles into an effervescent pool. The Water Gardener’s Bible is a one-stop practical guide to creating that back garden aquatic oasis. Use the various pond-related categories to guide you from the planning stage through to a balanced and mature pond, full of growing, healthy fish and plants.